Jenny Matlock: Alphabe-Thursday - Happy New Year! Happy New Year, Ms. Jenny! It has so great getting to know you this year. I look forward to you posts and linky parties in 2011. Happy New Year! Guess what my first Alphabe post of the new year will be about you. My current post is about Macy's holiday window display called "Yes, Virginia," so sadly I can't add it to a new year's Alphabe Thursday meme...but I wanted to wish you a very happy healthy new year filled with many blessings! Have a wonderful celebration! Thanks for hosting Jenny! Happy New Year! Dear Jenny, it's been quite a year for me. I wish I could say it's been great but it hasn't. I've been in the hospital twice, for heaven's sake! But I did have a joyous wedding and acquired a beautiful daughter-in-law and, at Thanksgiving, I found out I will be a grandmama in late July. Those happy events overshadow all else. 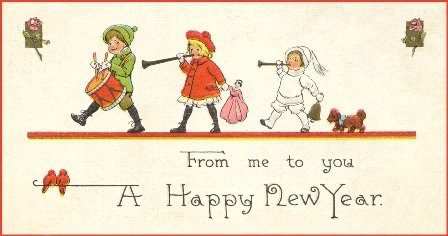 I hope for good things in the new year and wish you every blessing in the year to come, as well. Wishing all the "Alphabetians" A HAPPY NEW YEAR! Happy New Year to you and your family, Jenny! Thank you for providing such a meaningful meme! Have a wonderful New Year Jenny! Happy New Year to you and your family. I love coming over and seeing your Alphabe-Thursday. I hope when you start at the beginning again, you will let me know. I really would love to play. Well, we're off shortly for another movie and an early dinner at the Cheesecake Factory (aren't gift cards the best??). See you in2011! Happy New Year!! Here's Wishing you a wonderful New Year Jenny. May it bring with it many blessings for your and your family.